System UI Tuner is an hidden and unique feature of Android Marshmallow 6.0. With the help of System UI Tuner you will be able to customize the settings, status bar, active the demo mode and enable battery percentage icon on your phone. But for this first you have to know how to enable and disable System UI Tuner in Android 6 Marshmallow. System UI Tuner is an important and hidden feature of Android 6.0 Marshmallow which allows you to customize quick settings, status bar shortcuts, turn on demo mode on your phone and show battery percentage indicator on your phone. All those novice user face difficulty to use this feature but there is no need to worry, after reading this guide you can easily enable and disable System UI Tuner in Android 6 Marshmallow. 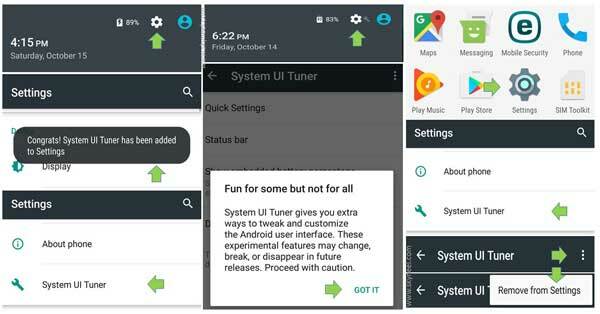 System UI Tuner is an experimental feature which is hidden on your Android 6.0 Marshmallow. But a Marshmallow user easily enable or disable System UI Tuner feature in his phone. You must have to take few given steps which helps you to quickly enable and disable System UI Tuner in Android 6 Marshmallow. After that you can do different things on your phone which is given below. Customize quick settings menu as per your need. Step 1: Swipe down top of your phone home screen with the help of one or two fingers. Step 2: Tap and hold on the Gear icon which is located on the top right corner until the gear icon start rotating. During rotating the gear icon remove the finger from your phone. Now, you will directly get entry in the “Settings” window and get the given message on your phone screen. Step 3: You can again swipe the home screen from the top and check the gear icon will be changed. Now scroll down the “Settings” page you will get “System UI Tuner” feature which is located in “System” category. When you tap on this feature you will get a notification message box just tap on the “GOT IT” option. If you don’t want to keep System UI Tuner hidden feature on your Android 6.0 Marshmallow then you can easily disable this feature from your phone. For do this job you have to take few simple steps on your phone. Step 1: After enabling the System UI Tuner in your Android 6.0 Marshmallow you can easily disable or hide this feature from your phone. First you have to tap on the “Settings” option from your phone. Step 2: Locate and tap on the “System UI Tuner” feature on your phone. Step 3: Tap on the three vertical bars which is located on the top right corner of System UI Tuner window. Now, tap on the “Remove from Settings” button. It will show you another confirmation box which ask you for given confirmation. Just tap on the “Remove” button. Now, System UI Tuner feature will be removed from your Android 6.0 Marshmallow phone. I hope after reading this guide all novice users easily enable and disable System UI Tuner in Android 6 Marshmallow. If you have any suggestion regarding this guide please write us in the comment box. Thanks to all.